THE coming month promises to be one of great excitement for Mary MacKillop College, Leongatha. 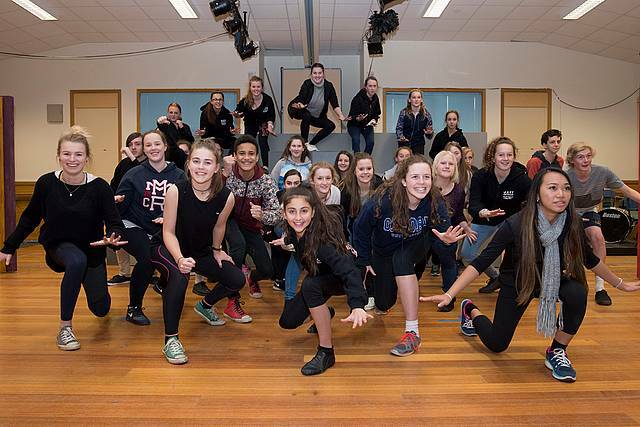 A large group of staff and students put the finishing touches to the school’s upcoming musical production, FAME Jr–the Musical, to be staged at the Wonthaggi Union Community Arts Centre on Friday and Saturday (matinee and evening show), August 14 and 15. In embarking on this project, an enormous amount of talent and theatrical experience has bubbled to the surface from both staff and students at Mary MacKillop College and the choice of the New York Arts School inspired show, seems the perfect fit. FAME Jr, conceived and developed by David De Silva, follows the lives of a diverse group of students who attend New York City’s celebrated High School for the Performing Arts and who aspire to “make it” on the big stage in dance, music and singing. The musical is a bittersweet but ultimately inspiring story that explores the issues that confront many young people today – issues of prejudice, identity, self-worth andperseverance as the students strive to turn their dreams into reality. The show is lively, with some great dance and song sequences and has been enthusiastically received in performances around the world since its premiere in Florida in 1988. The college has pulled together a very strong production team. The director, staff member Laura Muranty, has had over 25 years involvement in the performing arts, including a period as a director of an Aboriginal dance company, two youth theatre companies in northern Queensland and also as an actor and children’s entertainer. Supporting Laura as vocal and dance director is another staff member, Bron Kalos who has extensive experience in dance and choreography, as well as conducting choirs and vocal groups with the Melbourne Concert Orchestra. Bron has been recognised for her work in the past with several significant awards, including most recently the Gippsland Education Service Award from the Australian College of Educators in Gippsland, for her work with students through the arts generally. Bron is also behind the wonderful choreography for Leongatha Lyric Theatre’s current production of Gypsy. Another high achieving graduate from the Victorian College of the Arts and current humanities teacher at Mary MacKillop, Matt Logan, adds his skills to this stellar production team as stage manager. Design co-ordinator is teacher of art and fashion at the college and well-known local businesswoman, Meg Steenholdt, and multi-instrumentalist and member of many bands and dramatic productions, Matt Van der Velden is musical coordinator. Back in April, some 120 students auditioned for the 35 roles in the cast and rehearsals have been progressing at an increasing rate throughout the last school term. A host of young, local talent has been revealed and even in the term holiday, the students spent two days at school, put the finishing touches to their performances. Both on and off stage participants in this production are very enthusiastic, excited and committed to making FAME Jr a great success. Costuming and set production is well under way and all is in readiness for a wonderful opening in a month’s time. The college is confident FAME Jr will be a “must-see” show for the whole South Gippsland community and urges those interested to book tickets as soon as possible. Tickets can be purchased either online at www.trybooking.com/142947 or by contacting Lynn Fowles at the college office on 5662 4255.